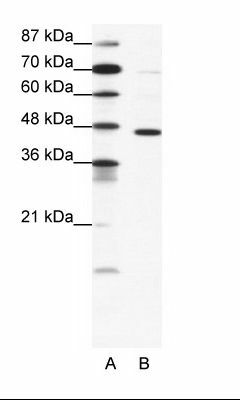 GABRP antibody LS-C481541 is an HRP-conjugated rabbit polyclonal antibody to GABRP from human, mouse, rat and other species. Validated for WB. Horseradish Peroxidase. Also available Unconjugated or conjugated with Biotin, FITC. 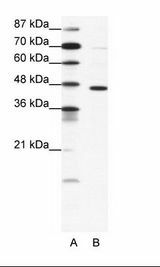 GABRP antibody was raised against synthetic peptide located between aa28-77 of human GABRP (O00591, NP_055026). Percent identity by BLAST analysis: Human, Chimpanzee, Gorilla, Monkey, Marmoset, Mouse, Rat, Panda, Dog, Rabbit, Horse, Pig (100%); Gibbon, Galago, Elephant, Bovine, Guinea pig (92%); Opossum, Platypus (85%); Turkey (84%). Short term: store at 4°C. Long term: add glycerol to 40-50%, aliquot to avoid freeze-thaw cycles, and store at -20°C. Protect from light. A: Marker, B: Jurkat Cell Lysate. This image was taken for the unconjugated form of this product. Other forms have not been tested.